Recently Techware Labs had the pleasure of reviewing the Vantec Nexus Fan Controller, provided by Extreme Alterations. Vantec has continued its tradition of making stylish add-on components with the release of the Nexus Multi-function Panel. Included in the packaging along with the unit are: 3 temperature sensors, 2 CPU fan cables, 1 Power cable, 1 USB 2.0 cable, 1 Firewire cable, 8 Allen screws for mounting the unit, and 2 additional faceplates (making 3 total) in colors green, light blue, and purple, and a user's guide for easy installation. The panel has the ability to control CPU fan speed with the large round knob in the middle of the faceplate, which acts as a rheobus for the fan on your processor. It will also display temperature readings from the CPU, HDD, and case on a backlit LCD display built into the front cover of the panel, which are controlled by a slender button located between the CPU fan speed knob and the display. Each push of the button toggles between the different temperature mode readings on the display. There are 2 additional USB 2.0 ports, and 1 Firewire port located on the opposite side of the CPU knob. In addition to the features you can see, is an alarm warning speaker on the PCB (printed circuit board) which indicates with a high pitched beep when the processor fan fails, or when temperatures rise above normal levels. Any person should be able to install the panel without difficulty. All connections are clearly marked on the PCB of the unit and if that wasn't enough, each end of the included connector cables are marked also. Instead of plugging the CPU fan directly into the motherboard, now it is routed from the CPU into the PCB on the panel and then from the panel into the motherboard. The 3 temperature sensors can be installed on anything you wish to monitor, although the sensor is too thick to go under the CPU where you really would want to record temp readings from, so you will have to modify it to work and risk damaging a sensor or simply mount it elsewhere and deal with a not so accurate reading. The dual USB 2.0 ports and single Firewire ports are pretty straight forward and connect to the motherboard easily. Once powered up the display will show the current temp (in Celsius only) and RPM of the CPU fan. The mode button allows you to scroll through the temperature sensors and displays the readings. The backlight makes viewing the display a breeze in a dark room. The 3 different colored faceplates will make it look sharp in most any case, or you can remove the colored faceplates completely and simply use the aluminum colored backing. 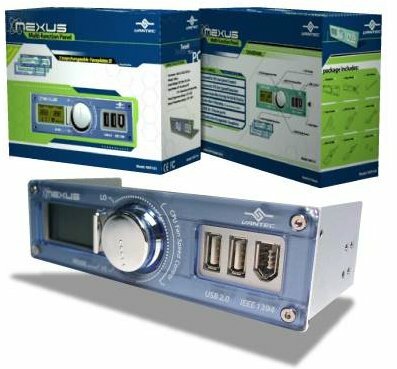 The Nexus Multi-function Panel will make controlling and monitoring CPU temps a snap. With the great design and ease of installation anyone should find the Multi-function Panel a great buy. With 4 different colored themes to choose from it should match any case and will look great. Be sure to visit www.extemealterations.com and get one for yourself, you won't be disappointed.